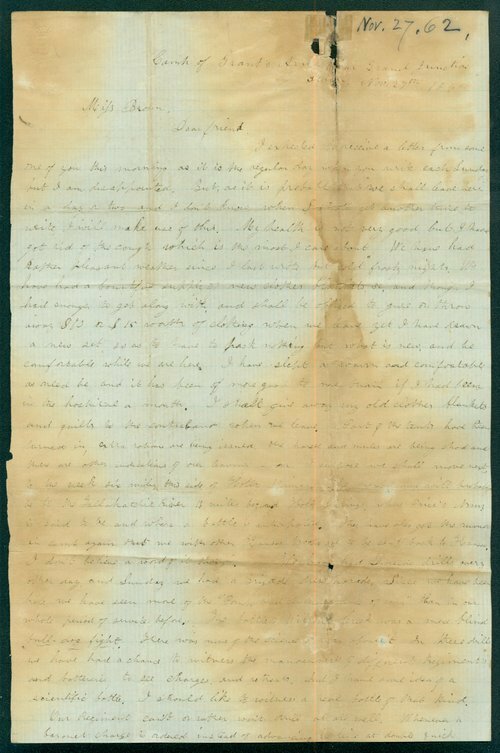 This letter, written by Leigh R. Webber from the "Camp of Grant's Army near Grand Junction Tenn.," was addressed to Miss Brown, a daughter of John Stillman Brown, a Unitarian minister who lived west of Lawrence, Kansas. Webber described camp life and mentioned the possibility that the troops would return to Kansas. He also discussed the contrast between "the pomp and circumstance of war" and the "blind bull-dog fight" he witnessed at the Battle of Wilson's Creek on August 10, 1861. The last portion of his letter deals with issues such as clothing, Thanksgiving, and other political issues.